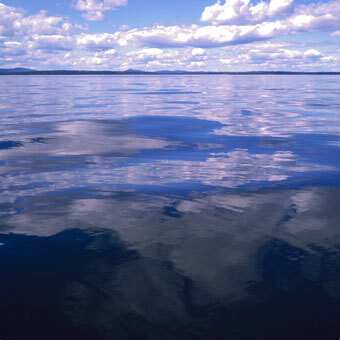 Cumulus clouds reflected in Penobscot Bay on a clear summer day. Water surface is smoth and undisturbed by wind or water currents. Jack navigates from Islesboro to Camden, ME in his 28' Crosby tugboat, the Paula B.